1932 ford Hot rod build that I did after work and on the weekends to have a little fun and work on something that I have such a passion for. I work at Watkinsville Service Center during the day and work on modern cars most of the time. We are a regular auto mechanic shop that will fix your breaks, get your air conditioning running cool, change your tires, fix that check engine light issue, or just make sure your car is in top shape for getting you to work. I know it is crazy to think that I would come home and work on this hot rod build after work, but it completely got under my skin. I have been tinkering with it for about 4 years. Last Christmas I had the whole family out and we brought up the project. My son and I have built a good bit of hot rods from the ground up. It started with a 63 Nova that for getting back and forth to school for my son. Low and behold we took it to a car show for fun and wine top prize. We actually won several shows and got a in a few magazines and get the editors top picks. It was a lot of fun we had together. We did ended up selling it and some how that turned into another build and then another. 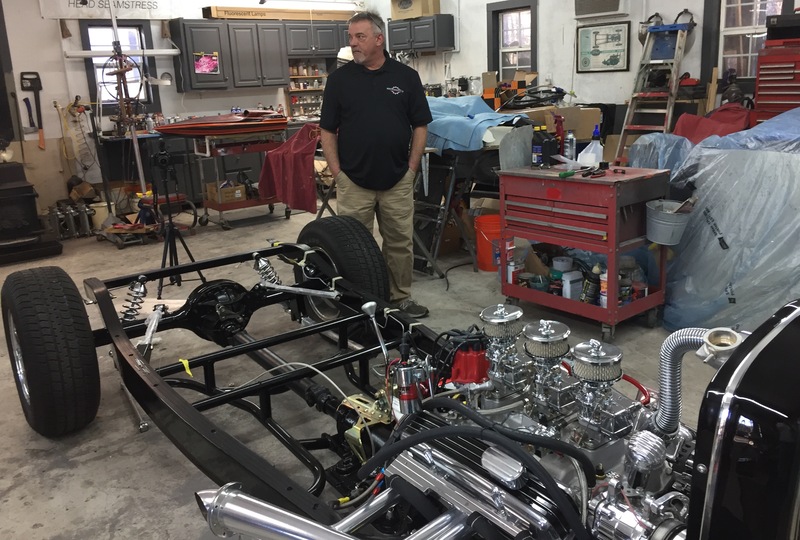 I have worked on several other hot rod builds including a 1923 T bucket, a 28, a 29, and a 30. Anyway back a Christmas we were looking over the sea of parts I had for this build and I thought I need to finish this for me, OK and my family. So I go to work and from frame to here in just a few months. I loved every bit of it. I really did try to forget about this project a few time but I have such a passion for the work that I had to get it finished. I saw this same model as a teenager and since then I knew I wanted to build or restore one for my self. I did this hot rod build from the frame up, Painted it, built the engine from a crate and bolted everything together. I plan on driving the car for a while, trips to the mountains and fun drives in the country, maybe a parade. With that in mind I did put as many modern items as I could, AC, power windows, power breaks. I wanted to have the look and feel with the convenience and safety of a modern car. I still have a couple of months work to go on this hot rod build, the whole Interior, some break work, and a few other things. One of the things I loved the most about this build was painting the flames on the side. I was thinking about doing it two toned, but in the end I really wanted it to have that street old school look and feel to it.